"Nor is it to be thought that CHILL or KULT were the oldest or the last of the horror roleplaying games, or that the common bulk of the World of Darkness was shelved alone. Call of Cthulhu was, Call of Cthulhu is, Call of Cthulhu shall be. Not displayed among the most popular titles in the game store but between them; it sits, serene and primal, unaltered through editions and left largely unchanged..."
THROUGH THIRTY-FOUR YEARS and six editions, Call of Cthulhu remained one of the most celebrated, influential, and imitated RPGs of all time. While other popular game systems went through violent and dramatic transformations--yes World of Darkness and D&D, looking at you--Cthulhu remained by and large unchanged. Instead of adapting itself to shifting industry tastes, it spawned imitators...a GURPS conversion, a pair of d20 conversions, a Savage Worlds conversion, a futuristic cyberpunk version and Ken Hite's brilliant Gumshoe adaptation (among many others). 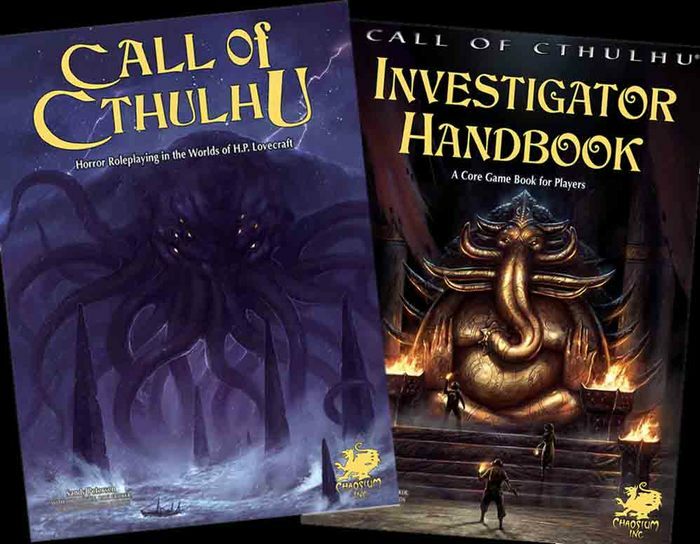 Like its namesake, Call of Cthulhu was a relic of an earlier age that reached out to touch the mind of dreamers and artists, compelling them to spawn new board games, RPGs, card games, video games, and (Elder Gods help us) plush toys in its honour. All the while it remained untouched by such things, "serene and primal." Because with the seventh edition Cthulhu has shrugged. Or possibly more to the point, "blinked." It seems to have given in to years of chat room trolling about its antiquated percentile system, and by trying to steer through the Scylla and Charybdis of detractors and die-hard fans, ended up giving us it's first major overhaul in decades that really, in the end, changes nothing. It's been divided into two gorgeous, full colour tomes, the Keeper Rulebook and Investigator Handbook. It has had new bells and whistles added to its percentile system. But the good news and bad news is that none of the system changes really amount to anything. If you liked Cthulhu before, you will probably play this and see little difference. If you are one of those who hated the percentiles, nothing here will change your mind. First published in 1981, Call of Cthulhu was the first explicitly "horror" roleplaying game. 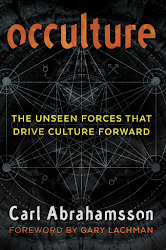 Based on the writings of celebrated American author Howard Phillips Lovecraft (1890-1937), Cthulhu depicts a incomprehensibly vast cosmos occupied by utterly alien, often god-like beings, in which mankind and its concerns are insignificant. There are no beneficent deities, humanity wasn't created in anyone's image, and there are no universal standards of good and evil. It is a brutal, uncaring universe where men struggle mainly to prevent the more powerful alien occupants from wiping out the human race too soon. It's charm was in inverting most other RPG tropes. You didn't create a first level character and watch him ascend to greatness...you created a capable professional and watched him slowly descend into madness. You didn't boast about your character's heroic exploits...you bragged about the horrific way in which she met her untimely end. It was a scary game, and a blackly humorous game. And it became an instant classic. As a final note, it was also a very flexible game. Generally played in one of three time periods (1890s, 1920s, modern era) it could easily be adapted to more. Probably the best adaptation was Delta Green, which introduced X-Files elements of modern conspiracy. And for those who thought Lovecraft's cosmos was too bleak, Call of Cthulhu could also handle standard tales of ghosts and ghouls, vampires and werewolves. Call of Cthulhu has always been about Investigators, normal men and women who get drawn into the mysteries of the Cthulhu Mythos and attempt to contain, banish, or destroy its horrors. The usual course of a game is to find clues and determine a way to deal with the threat. This seldom involves combat. Indeed, more crucial to a character than Hit Points are Sanity Points, a trait rated on a scale of 0 to 00 with higher being better. As you encounter the horrors of the Mythos, you are at risk of losing Sanity. Lose enough, you go temporarily insane. Lose it all, and your character is mad forever. The system used to work like this; your Investigator had nine characteristics, each determined by a 3d6 roll or some variant. These also determined Hit Points and Magic Points and a trait called Sanity. These were your innate attributes. In addition to them you had learned skills, rated on scales of 0 to 100%. To use these skills you rolled against them on a d00. A result of 96-00 was a Fumble, a catastrophic failure. A roll above your skill percentage was a regular failure. A roll below your percentage was a success, and a roll of 01-05 was a critical success. Sometimes, rolling below 1/5th your percentage was a significant success as well. It was all fairly simple, and rolling against characteristics was done by multiplying them by 5%. Detractors have long complained about the d00 roll. Compared to something like the Cypher System, it's pretty stark. In Cypher (which I use as an example solely because I just reviewed it), if the GM wants to see if players can spot a clue he assigns finding it a difficulty, and the players can lower that difficulty by spending certain character points if they like. But in Cthulhu, you rolled those percentile dice against your "Spot Hidden" percentage and that was that. This works, I think, perfectly for a game set in a cold, uncaring universe where human action is ultimately insignificant. But gamers like to win. Hence the complaining. This isn't to say some f the complaints aren't valid; Ken Hite's Trail of Cthulhu is in part an attempt to address the issue. But people who have run Cthulhu for decades usually just house ruled things when necessary, or for really vital clues made sure the player's found them. It was never that big of a deal. 7th Edition seems to be an attempt to address the "problem" as well. The first fix lies in "pushing." Now if you fail a roll, you are able to try again, but this time failure brings with it a significant risk of something dreadful happening. The second lies in modifier dice, a concept which feels straight out of Dungeons & Dragons 5th Edition. For certain rolls now you get positive or negative modifier dice; these are additional "tens" digits. For a positive modifier, you roll and take the lowest tens digit. For a negative, you take the highest. Neither of these are bad ideas, but they feel like house rules that could have just been implemented into your Sixth Edition game. A bigger change perhaps is that Characteristics, like Skills, are now all rated on a scale of 0 to 100. I'm not entirely sure what this was meant to "fix." Yes, it does save you the trouble of multiplying your POW x 5 to determine Sanity...but now your Hit Points have to be figured by adding SIZ and CON together and dividing by ten. Nothing seems to really be gained by the changes. In another change, Skills and Characteristics all have several ratings on the sheet now. There is the full percentile, then half that, then 1/5 of the original. So if a skill is 50%, it is also written 25% and 10%. The Keeper now calls for rolls based on their difficulty (regular, hard, and extreme). It also allows the quality of successes to be rated. This matters mainly in the exorcism of the old Resistance Table, which has now been replaced with straight forward opposed rolls. If two characters arm wrestle, and one gets an extreme success, he beats his opponent who only scored a hard success. Again, these are not bad mechanics, but it is hard to see what they really change. As I have said, the game is still Call of Cthulhu. It keeps the same tone, lists the same spells and creatures, and most of it works the same way. There are all sorts of new essays and ideas to help Keepers (the GM) run the game, and the Investigator Handbook is essentially the old with edition 1920s Investigator's Companion, with expanded character creation options and details on life in the 20s. 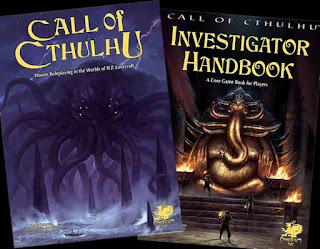 The latter volume also includes the story "The Dunwich Horror," replacing "The Call of Cthulhu" as a sample piece of Lovecraft fiction (a good choice, "Dunwich" reads and feels far more like a typical Call of Cthulhu adventure). The Keeper Rulebook contains character creation in brief as well in addition to all the rules, monsters, and spells in the game and a new (lengthy) chapters on Chases. So what to make of the 7th edition? The bottom line is there is nothing here to persuade fans of 6th Edition to trade up, but nothing to deter them either. The rules changes are in essence on the level of house rules that could easily be implemented in previous incarnations. Likewise, there is nothing here that will convince Trail of Cthulhu or Realms of Cthulhu fans to switch back. In the end, the big, fresh, Kickstarted Call of Cthulhu 7th Edition is just the previous game with a fresh coat of paint, much like any of the other previous editions. 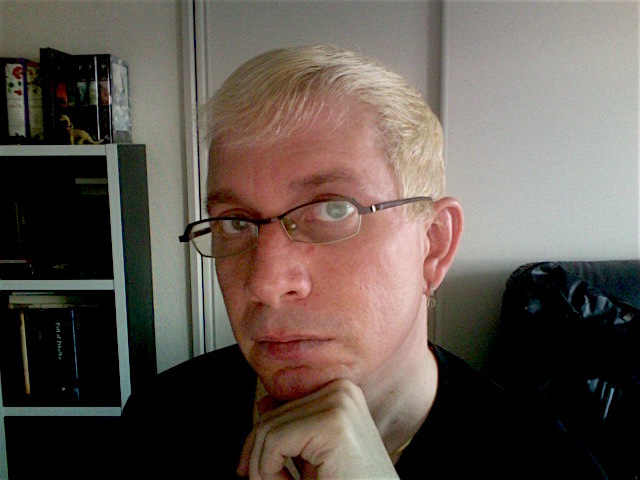 The only difference this time is that the shade is a bit different. nice review. Thanks for the insight.